We have sampled the trains of Czech, Poland and Slovakia and found them to be good, mainly because they are available – that’s a new experience for someone from Australia – but also because they are inexpensive, carry bicycles and run mostly on time. Helena, our couchsurfing host in Olomouc, told us about the loud screeching brakes of Czech trains as they pull into stations, and it is true. You must have both hands free as a train approaches so you can block your ears. Railway stations in Czech vary in standard from unkempt and overgrown (small regional ones) to well maintained with geraniums and newly paved platforms. The station masters stand proudly on their platforms wearing their red peaked caps as trains go through. With my expertise in purchasing tickets we have never had any difficulties with loading our bikes on. Not so for a German couple who we witnessed yesterday trying to get their bikes on the train in Cesky Budejovice. They didn’t have bike tickets, and although there was plenty of space in the luggage van, the conductor wouldn’t let them on. He had to obey the rules and so did they. Discussion occurred followed by arm waving by the Germans and shoulder shrugging by the conductor but the result was the same. All the major towns have public transport, many with trams, trolley buses or both. Regional bus networks are also good, with bus stops in every village and along country roads. The buses are modern. International trains are named after composers. 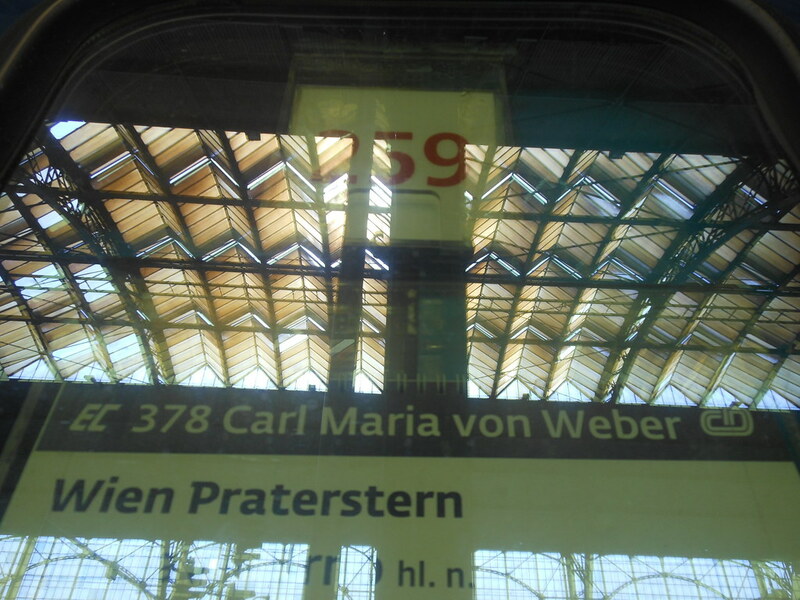 We are on the Carl Maria von Weber from Prague to Dresden. We saw the Anton Bruckner on its way to Linz earlier. Ok – now the apples. There is a lot of unregulated apple growing going on all over the place. There are thousands of apple trees all loaded with fruit. They are not in orchards, just by the road or in gardens. The question is: what is going to happen with the apples? We have eaten apple strudel and apple cake whenever possible so we are doing what we can, but there are still a lot left. We will continue to do our best. This entry was posted on 28 July 2012 at 8:57 pm and is filed under Czech Republic. You can follow any responses to this entry through the RSS 2.0 feed. You can leave a response, or trackback from your own site. I see Carl Maria von Weber brings you to Alex, just bring him my greetings over!